Dark-colored streaks in toenails are common in the United States, especially amongst people with darker skin toes, particularly in African-Americans. For the most part, these streaks usually represent non-serious conditions. However, especially in fair-skinned people, the presence of these streaks could represent a deadly cancer. This article will discuss the common causes or dark streaks in toenails, and what condition is cause for alarm. Before beginning, the reader should be aware while reading this article that the information contained is not meant to provide tailored medical advice specific for one's own medical condition, but is meant as a general discussion on this health topic. Any specific questions or concerns for the conditions described in this article should be directed to one's own general physician or specialist for proper diagnosis and treatment. The toenail is a dense tissue made of compressed keratin. The nail plate itself begins in the nail matrix, which is essentially the root of the nail. The outer edge of the matrix is seen externally as the lunula, or the white semi-circular shaped area at the base of the nail just beyond the cuticle. The nail slowly grows outward, sliding semi-loosely along the skin. The color of the nail itself is a kind of opaque white or cream, with some clearness in it to see the skin below it. Discolorations in the nail plate, be they solid white, yellow, blue, brown, or black, are abnormal and represent a disease process. 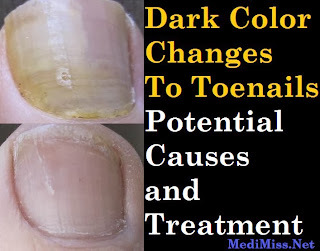 The most common sources of toe nail discoloration are due to keratin debris built up under the nail from natural nail thickening and aging, as well as discoloration from a fungus infection. These typically create a white, yellow, or yellow-brown discoloration. Since both of these lengthy topics have been covered by this author in other articles, the causes of darker shades of discoloration will be presented here. Dark toenail discoloration has several causes, and properly diagnosing the cause is key to a successful treatment. The most common reason nails become darkly colored is because of bruising under the nail. Bruising is essentially blood left behind by bleeding. It can occur under the skin, and can also occur under and over the top of the skin located directly under the toenail. Bleeding under a toenail can be caused by dropping a heavy object onto the toe, by pressure from tight fitting shoes, by toes jamming into the end of the shoe as seen often in runners, and by stubbing injuries that cause blood vessels to burst. Spontaneous rarely if ever occurs, and often if one does not remember injuring the toe it usually means the injury was minor enough not to cause initial, memorable pain. The bruising under the nail stays in the nail plate until it grows out with the nail. Bruises that do not grow out as the nail continues to grow are cause for concern, and a podiatrist should be contacted. The potential cause for this will be discussed later. When the bruising takes up less than a quarter or a third of the nail, it can likely be left alone and the nail can be allowed to grow out. If the bruising is more extensive, covering the entire area of the nail, the nail plate should be removed. This is done for two reasons. Firstly, it allows the blood to properly drain, and limit's the amount of damage the bleeding caused to the nail root when it slightly lifted the nail plate during the time of active bleeding. Secondly, the bleeding may have been caused by a deep cut to the skin underneath the nail plate during the initial injury, and this skin needs to be evaluated for any cuts that need to be stitched. Another concern, especially if a fracture has occurred to the bone under the nail, is pieces of bone sticking out into the skin externally. If these are not removed and the skin cleaned and treated properly, infection can develop which may spread to the underlying bone. Another cause of dark discoloration is infection. As discussed before, fungus can enter the skin under the nail and cause discoloration, thickening, brittleness, and debris. 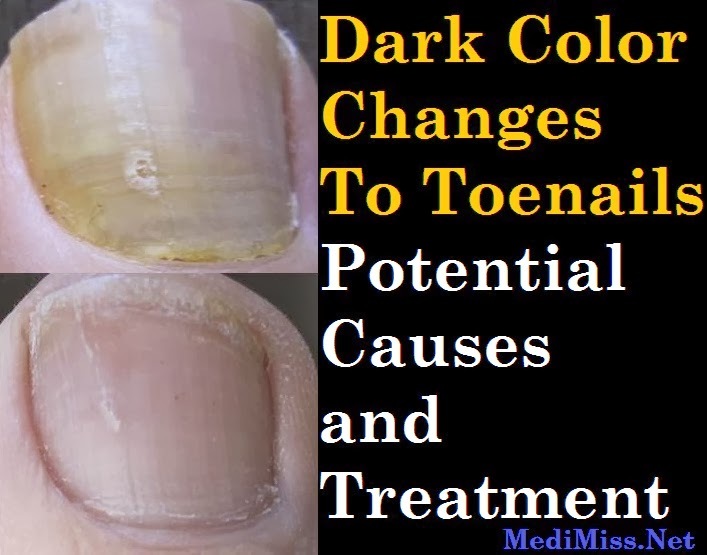 This fungus is the same in the same group of organisms that causes Athlete's foot, and from a color perspective can change the nail from opaque to solid white, yellow, grey, brown, or even black in some cases. Treatment is somewhat complex, as only certain medications have any scientifically proven effectiveness, and there are many home-spun treatments still used that simply fail to show any real worth. Another source of infection is from bacteria, specifically bacteria from a family of organisms called Pseudomonas. This bacteria is prone to invade skin that has been kept moist for awhile, and is commonly spread in whirlpools and hot tubs. The bacteria creates a green color change in the skin and nail tissue, presumably from iron pigment. The so-called green nail syndrome is common, and is treated with a special diluted vinegar solution (acetic acid) soak, or with specific antibiotics targeted against pseudomonas. This infection rarely progresses to a more serious condition in otherwise healthy people, and is usually easily treated. Nail discoloration that moves across the width of the nail in a thin line from one side to the other side has many different causes to numerous to discuss in detail. The causes can include disorders of the kidney, deficiencies of certain minerals, toxic metal poisoning, heart disease, chemotherapy for cancer, certain chronic medications, and major injury to the body. Due to the wide variety of causes, a visit to one's primary care doctor, dermatologist, or podiatrist is recommended. There is generally no immediate treatment for these lines, but one's physician may be able to diagnose another condition that needs treatment through examining the nail, especially if something like metal poisoning or mineral deficiency is undiagnosed. Nail discoloration that travels in a streak from the beginning of the nail to the end is the one symptom that is cause for the most concern. This streak is typically brown, dark blue, or black, and can be found on one side of the nail or in the center. Usually, this streak takes up less than one quarter of the width of the nail itself, although in some cases it can be wider. The usual cause of this streak is the overproduction of the cells that produce skin pigmentation, otherwise called the melanocytes. These cells produce melanin, which gives darker-skinned people their skin tone, and Caucasians their skin tan. It naturally protects the skin from the harmful ultraviolet rays of the sun, although overexposure to sun can lead to a mutation in the production of melanocytes. This is technically a cancerous growth. In most instances of nail streaking and skin conditions such as moles, this is a benign growth. However, malignant cancer can develop which has the potential to spread to other organs, leading to death. This cancer is called melanoma, and it is deadly. Dark streaks beginning at the cuticle and traveling along the length of the nail are very common in those with darker skin tones, particularly African-Americans. In fact, many people have streaks on nearly all their toenails, and have had them since birth. These do not generally represent melanoma of the nail, and are usually benign. When these streaks are newly developed in caucasians, or if there is a new growth or change in a preexisting streak in someone with darker skin, the nail and skin surrounding the nail needs to be assessed by a physician. This is especially true if a discoloration of the skin next to the nail is developing, no matter what the original tone of the skin. A biopsy of the streaked part of the nail, the nail root, and the surrounding area of skin needs to be performed to ensure there is no malignant cancer. This is a simple procedure, done usually in an office by a podiatrist, dermatologist, or sometimes a general surgeon or family doctor, and it heals quickly. The nail usually grows back healthy if the condition was benign. If melanoma is present, immediate attention must be made to the toe to prevent further spread. This usually includes amputation of the tip of the toe, or the toe in its entirety depending on the size of the melanoma. This is absolutely necessary to save one's life and prevent spread of the cancer. As one can see, dark discoloration of the toenails can have numerous different causes. Most are benign, and resolve with simple treatment. Some are simply genetic, such as the common nail streaks in darker-skinned individuals. Others are dangerous cancers that need immediate treatment. Due to the potential for cancer, this author recommends that all areas of dark discoloration in one's nails be assessed by a physician to ensure the condition is benign. The least one wastes is a little time in the doctor's office, and at best one can save their own life.